There are often astrological themes that run through families. This is particularly the case if different family members continue running the family business. But what sort of astrological themes should we look for if the family business is saving souls and reducing poverty ? The planet that would cover this has to be Neptune. Religion comes under the auspices of Jupiter and Neptune. Jupiter rules the church and the institutions of religion but Neptune is the spiritual impulse itself, its the planet of the mystic and its sole aim is to dissolve the boundaries between people both spiritual and material. If Neptune is strong and well placed in a chart its subject is generally empathic and compassionate, and is happy to serve other people even if it means considerable self sacrifice. The Salvation Army came into being in the latter part of the 19th century and was established by William Booth and his wife Catherine. Their work was carried on by their children Bramwell and Evangelina. In Astrology the planets represent certain life energies, Neptune represents the principle of spiritual awakening but also of the dissolution of the barriers between men and God. The signs represent the way an individual goes about expressing these energies. Booth’s way of attaining his goal was to form an army. The Salvation Army was modelled after the military, with its own flag and music. William Booth and the other soldiers in “God’s Army” would wear the Army’s own uniform for meetings and ministry work. He became the “General” and his other ministers were given appropriate ranks as “officers”. Other members became “soldiers”. The sign that would most fit this approach must be Aries. The Army spread very quickly throughout the world particularly through the British empire. The organisation involved was phenomenal. Booth proposed a strategy to apply the Christian Gospel and work ethic to the problems. Booth’s book spoke of abolishing vice and poverty by establishing homes for the homeless, farm communities where the urban poor can be trained in agriculture, training centres for prospective emigrants, homes for fallen women and released prisoners, aid for the poor, and help for drunkards. He also laid down schemes for poor men’s lawyers, banks, clinics, industrial schools and even a seaside resort. This focus on the work ethic and the level of structure and organisation suggests some influence from the sign Capricorn. The simple focus on redemption through work and the somewhat puritanical approach suggests something of Capricorn’s ruler, Saturn. William Booth the founder and ‘ General ‘ of the Salvation Army was an Aries but a particularly powerful one. His Sun was right at the top of the chart but it was also the apex of a T Square. The Sun in this position denotes an extremely strong personality, someone whose light shines powerfully and whose impact would be considerable. Booth also has Leo rising so he would make a natural leader. The T Square itself however shows the nature of his calling and his response to it. The aspect pattern is based on an opposition between the Moon in Cancer in the 12th house and Neptune in the 6th. The Moon in Cancer is a very sensitive placing, it gives a strong empathic nature and an ability to feel what others go through. It is the classic placing of the mother and it naturally seeks to protect and nourish all those in its charge. In opposition to Neptune, this sensitivity becomes heightened, he sees the suffering of others and wishes very strongly to help. Both 6th and 12th houses are about service to others, the 6th house through work and the 12th through a kind of spiritual selflessness. The other interesting factor about this T Square is it includes Saturn as well in a wide conjunction with the Moon. William Booth was a Methodist evangelist minister who felt his position in the church was restricting his ability to help others so he left to dedicate his life to work among the poor. His opposition enabled him to clearly see the problems of poverty and suffering and the awareness of these issues forced him towards the apex Sun in Aries in the 10th house, to pioneer and establish an army and organisation to cut through the problems facing mankind. The exactness of his Sun’s square to Neptune shows the major theme of his life. William was aided in his life’s work by his wife Catherine. Unfortunately no time is available so a noon chart is taken. 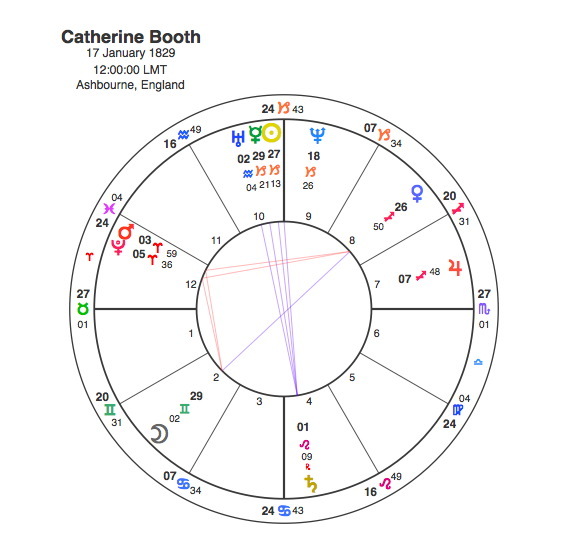 Catherine Booth’s chart has many of the same features although a different personality to William. While William was a fiery Aries / Leo combination, Catherine had the Sun and Ascendant in Earth signs. She was a Capricorn but she also had the Sun in conjunction with Neptune and in opposition to Saturn. This combination would again enable her to see the suffering of the masses and would give her a strong desire to do something practical about it. Aries was also powerful in Catherine’s chart as she had a strong Mars / Pluto conjunction at the apex of a T square in that sign. This conjunction would make her sign up to the army. Catherine’s Sun was square to William’s and strongly placed within his T square in exact opposition to his Saturn. They were no doubt devoted to each other but their relationship was probably very serious. Their son Bramwell took over as ‘ General ‘ when William died. Like his father, Bramwell had an extremely close aspect between the Sun and Neptune, in this case the conjunction in Neptune’s own sign the compassionate and sensitive Pisces. Jupiter was also in close conjunction. 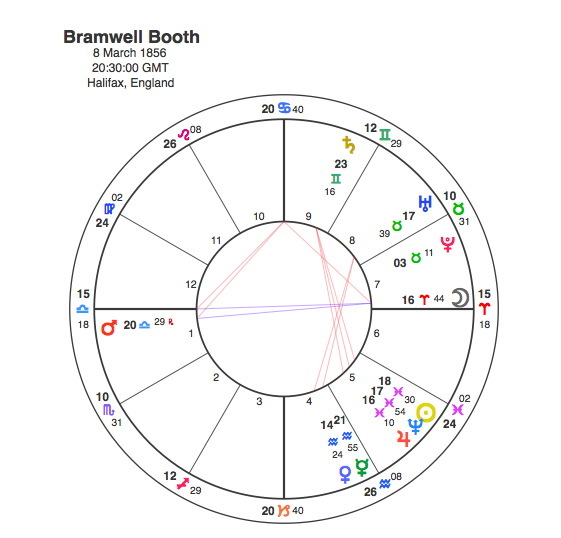 Bramwell’s Moon is in Aries in opposition to both Mars and the Ascendant. This aspect greatly strengthens his Arien qualities. Again we have this fascinating combination of Neptune sensitivity and service with Aries combativeness and assertion. 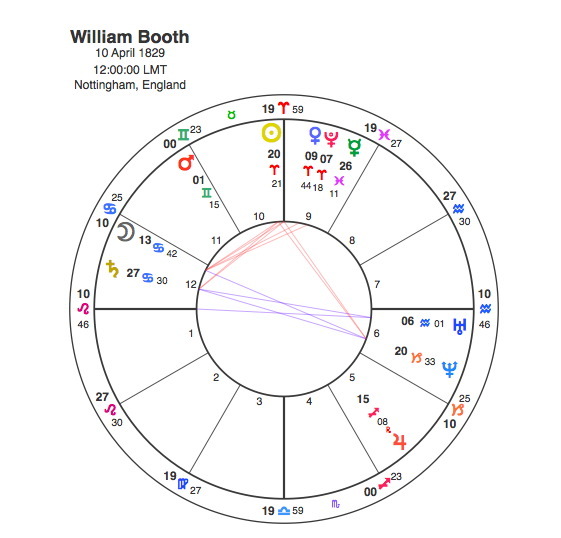 Bramwell’s Moon / Mars / Ascendant combination falls within William’s T square. Bramwell’s Moon is conjunct William’s Sun, a perfect aspect for someone following on in the succession. Bramwell’s sister Evangeline took over as ‘ General ‘ after he died. Like her mother Evangeline had the Sun in Capricorn and like her brother she had the Moon in Aries. The Moon was in close conjunction with Neptune. The whole family had the same themes very strongly represented in the charts. As always its very interesting to look at the transits of Pluto for all of the Booth family. The whole thing could be said to have started between 1842 and 44 when Pluto was conjunct William’s Sun. His turning point came when his father Samuel Booth could no longer afford his son’s school fees and apprenticed the 13-year-old William Booth to a pawnbroker. Samuel Booth died on 23 September 1843. Two years into his apprenticeship Booth was converted to Methodism. The second turning point was in Catherine’s chart when Pluto was square her Sun in 1851 when she first met and got engaged to William. The third one was in 1861 when Pluto was square William’s Ascendant. At the Liverpool conference in 1861, his request to be freed for evangelism full-time was refused yet again, and Booth resigned from the Methodist ministry. Turning point 4 was with the birth of the Salvation Army in 1878, Pluto was conjunct Catherine’s Ascendant. No 5 was in 1912 when William Booth died. Catherine had herself died in 1890 but the intriguing thing was Pluto was conjunct Catherine’s Moon and opposite her Venus in 1912. Venus was in the 8th house so the death ( 8th ) of her life partner ( Venus ) was inevitable. Just because she was already dead it didn’t mean her astrology stopped working. The sixth episode was in 1904 when Evangelina returned as Army Commander of the United States.. In the aftermath of the 1906 San Francisco earthquake, she led a mass meeting in Union Square, New York, and raised over $12,000 for Salvation Army relief work amongst the victims of the disaster. During this period she became a US citizen. Pluto was conjunct Evangelina’s Ascendant and opposite her Venus and Mars conjunction from 1904 – 08. No 7 was in 1917 when despite the differences between Commander Evangeline and US General Pershing, the first of 250 Salvationists left New York for the front line of the Great War in France. They soon won the confidence of the troops with their cheerful brand of ‘seven-days-a-week’ Christianity. The American people subscribed an unprecedented $13 million to clear debts incurred by The Army, through its provision of canteens, hostels, rest rooms during the war, and afterwards on the provision of care and accommodation for the returning forces. 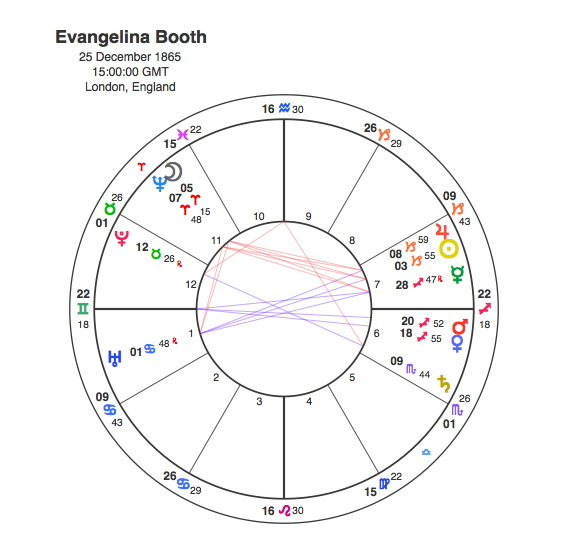 This marked a major watershed for both Evangeline and the Salvation Army which was confirmed by Pluto being opposite her Sun and square her Moon at the time. Turning point no 8 occurred with the death of Bramwell in 1929 as Pluto created a T Square to his Moon / Mars and Ascendant opposition. 8 watersheds in one family is pretty good going for a planet that hadn’t even been discovered. The Booth family were an exceptionally inspiring unit that genuinely fought for their beliefs and against poverty. It’s extraordinary that the Neptune / Aries theme is so powerful in all four charts but what would you expect from the leaders of the Salvation ( Neptune ) Army ( Aries ) ? I have some friends in the Salvation Army and they continue the Booths work to this day being the hands and heart of Christ on earth.